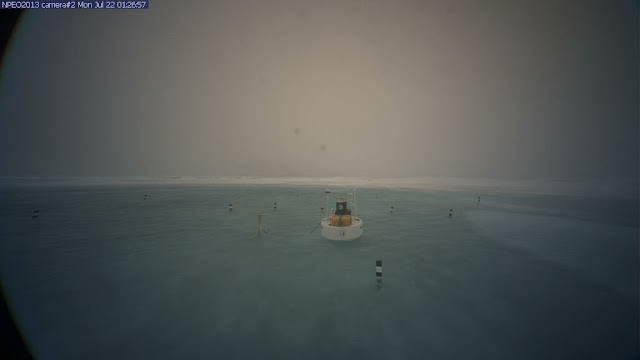 Images from the North Pole Environmental Observatory are now showing large areas with open water at the North Pole. The image below is from Webcam 2, dated July 22, 2013. Furthermore, the number of spots with methane readings of over 1950 ppb appears to be rising. See related posts below to compare. 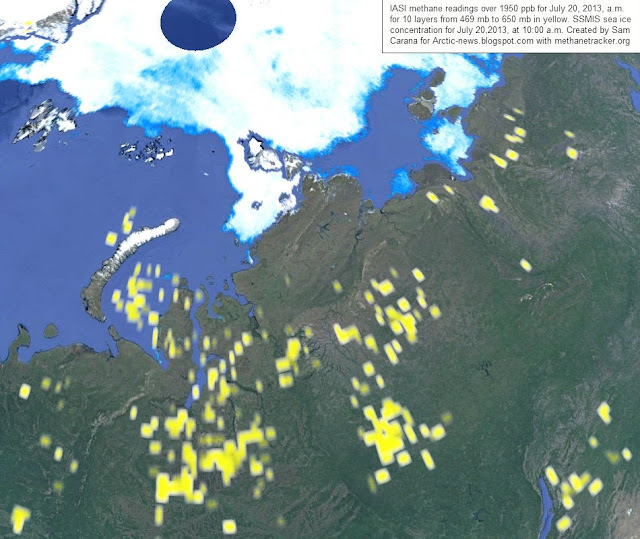 Particularly worrying are the large number of spots over the Kara Sea. Also note the spot over Greenland in the top-left corner of the image below. The webcam shows water at the North Pole. Clearly, there still is some ice underneath the water, as is evident from the stakes that have been put into the ice to indicate the depth of surface water. Surface water can build up as a result of melting as well as due to rain. 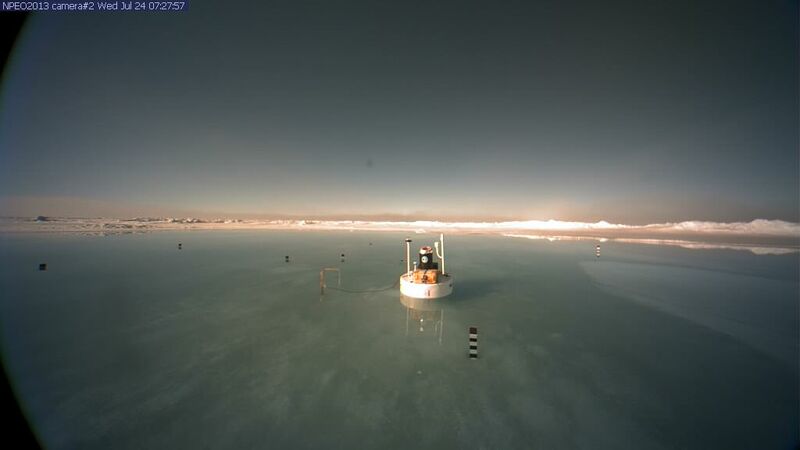 As the image on the right shows, the ice is getting very thin. 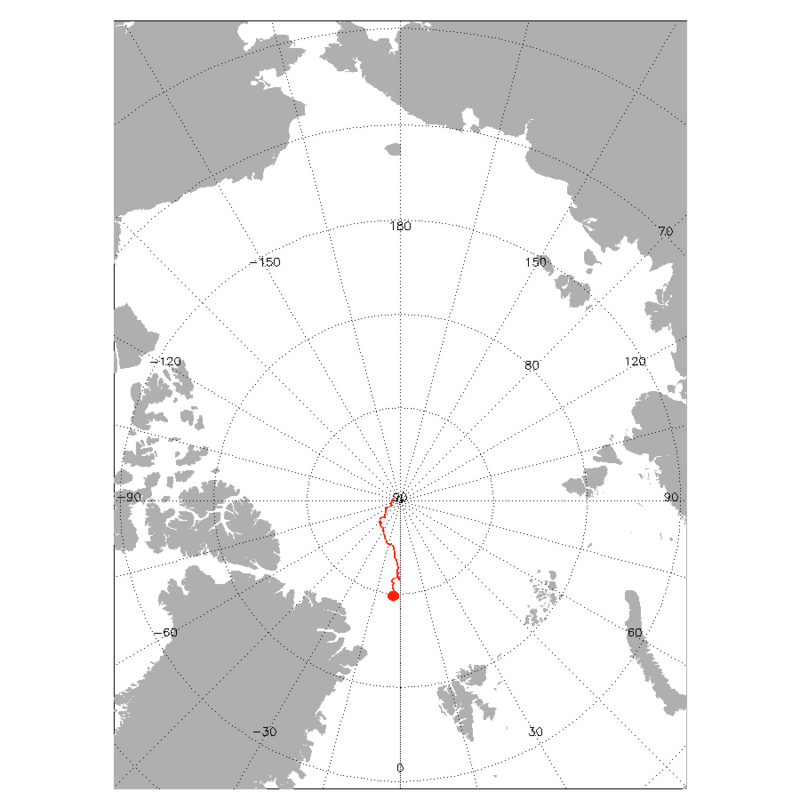 In between the North Pole and Siberia, a wide corridor has developed where the ice is between zero and one meters thick. Surface water could extend over this corridor, all the way to edge of the ice, in which case it effectively becomes part of open water. 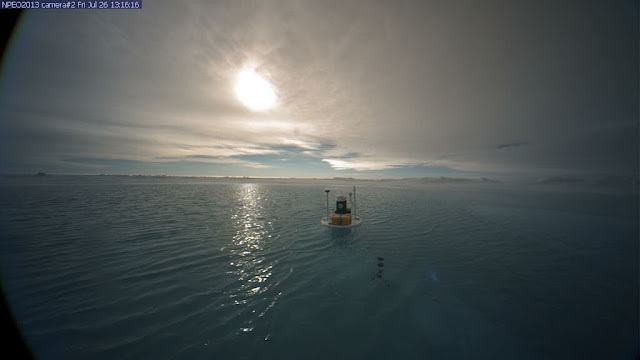 The presence of water in areas close to the North Pole has been discussed in a number of earlier posts, such as this one. The image below, from the Danish Meteorological Institute, gives some idea of the extent of the sea surface temperature anomalies that have been particularly prominent in the Kara Sea for some time. 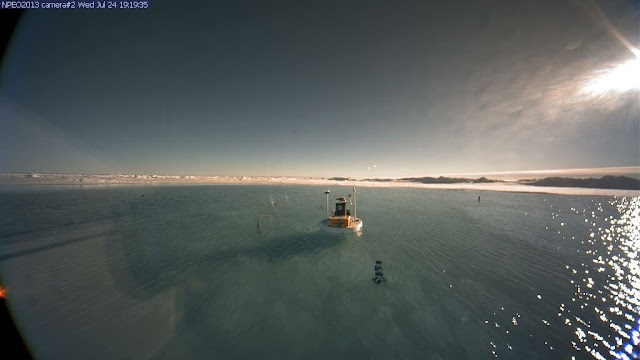 Meanwhile, more water has appeared around Webcam2. Below are four later images, the top two images captured on July 24, 2013, the third one captured on July 25, 2013, while the bottom one was captured on July 26, 2013.
for scale, see image further above. 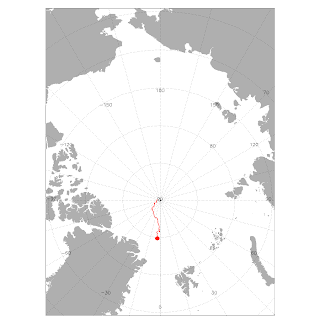 Buoy data up to July 28, 2013, buoy position: 84.87 N, 4.29 W.
On the animation above right, the track is shown against a sea ice thickness map, showing sea ice at webcam2's current position that is two meters thick. 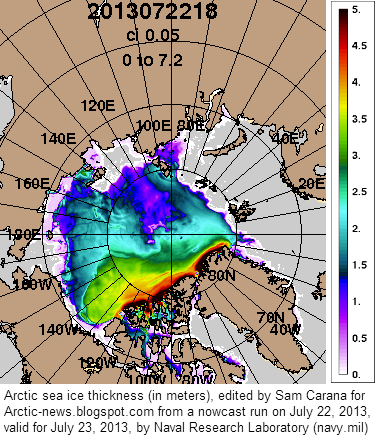 So, while satellite images may indicate that the sea ice is still several meters thick in many locations, huge amounts of surface water may be present on top. 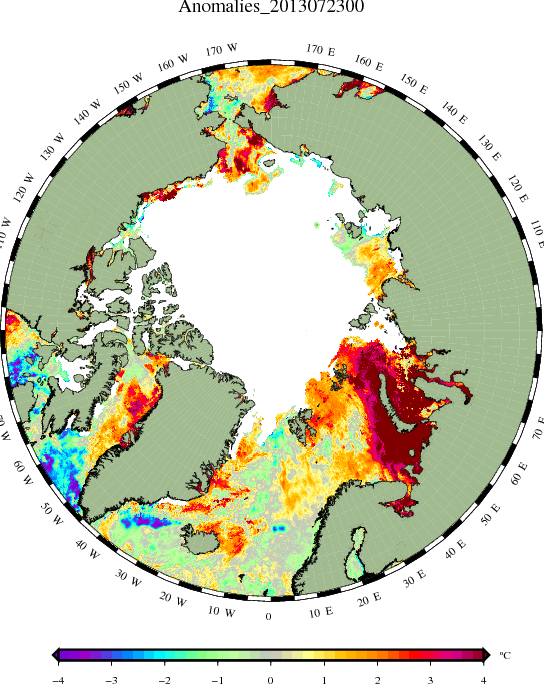 The albedo of water is far lower than ice, so less sunlight is reflected back into space and a lot more heat is absorbed by the water, further accelerating the sea ice melt. This spells bad news for the remaining sea ice, since the melting season still has quite a bit of time to go. Let's end with a video uploaded at youtube by climatecentral.org covering the period from April 16 to July 25, 2013. Please note that the photos from Webcam 2 do not show "open water", but surface water on top of ice. 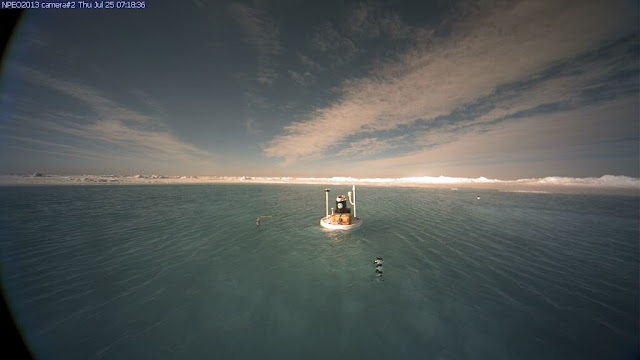 There are survey stakes driven into the ice in a regular pattern across the photo field. Noted, Peter. Some further text has meanwhile been added to explain that 'open water' does not necessarily imply a complete absence of ice. Surface water can extend all the way to the edge of the ice, in which case the water effectively becomes part of open water. Everyone on Planet Earth, please: wake up. It's Time to put all enmities aside, to tell our leaders they must now lead us in combating greenhouse gas emissions with extreme urgency or stand down. To tell our leadrers to join with all other national leaders in this. To halt deforestation IMMEDIATELY, cut personal fossil fuel usage as much as possible IMMEDIATELY. Re-jig the money system IMMEDIATELY, so that lack of money doesn't stop us tackling this catastrophe. Arctic Methane Release: "Economic Time Bomb"